LEMOORE, CALIFORNIA (April 19, 2016) – Team Silco Racing development driver Ben Silliker, 11, scored his third win of 2016 and first career USAC Micro Series victory, claiming Saturday night's feature at Dixon Speedway. The Restricted 600 win gives Silliker three victories this year with one each in Outlaw Karts, Jr. Asphalt Late Models, and Micro Sprints, in 18 starts. He has also racked up 11 top-five finishes. Not only did Silliker earn a victory Saturday night at Dixon, he added a third place run at Plaza Park Raceway in Visalia on Friday night. The combination runs should make Silliker the unofficial USAC Micro Series points leader for the new series. Silliker overcame a bought with the flu to qualify second at Dixon with an 11.353 second lap on the large nearly one-fifth mile race track. Although he failed to finish his heat race, Silliker lined up third for the 20 lap feature against a 19 car turnout. The Alberta, Canada native wasted little time going to the front and was in the lead by lap three. Silliker ran his quickest lap of the main event on lap 12 en route to a 2.079 second victory. On Friday night Silliker qualified sixth out of the 17 Restricted 600s on hand at Visalia's Plaza Park Raceway. He added a second place finish in his heat race to set the stage for the main event. Starting from the pole, Silliker led the first 20 laps of the feature dicing in and out of lapped traffic. Contact with a lapped car bounced him back to third where he would ultimately finish the main. A total of 37 laps were led by the black #24 over the weekend. Ben's younger brother Alex raced both nights in the Jr. Sprint division, continuing to gain experience this year. He has also raced in Box Stocks in the outlaw kart ranks this year as well. His 2016 has been one of his busiest years yet with already seven starts under his belt. 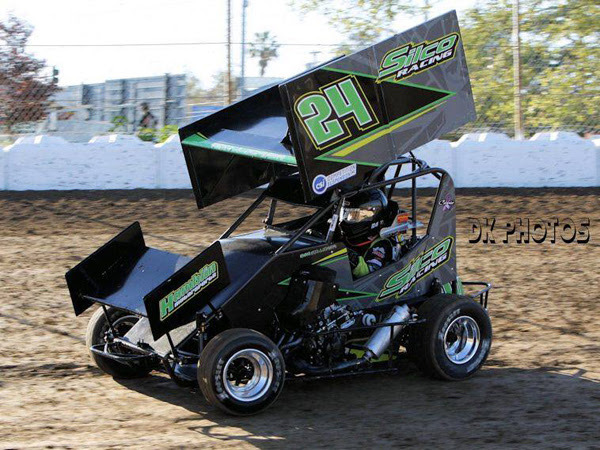 Team Silco's busy season continues this Saturday at Lemoore Raceway with both Alex and Ben Silliker competing in Micro Sprints. Ben Silliker will then climb back aboard the #24 Jr. Late Model on pavement at Madera Speedway on April 30th for round #2 of the MAVTV-televised youth series. Team Silco Racing is presented by Hamblin Motorsports, Micro Blue Bearings, Evolution Racing Products, Blakesley Sports Media, CSI Shocks, Vahlco Wheels, Beard Motorsports, and Motion Media Wraps. Saturday, April 23rd After having to deal with cancelling their season opener last Saturday due to rain, All American is set to open this Saturday with racing from the high flying North State Modified Racing Series along with the Bomber and Pro 4 Mods. The gates will open at 4pm followed by opening ceremonies and racing at 6pm. General admission tickets for adults, age 16 to 59, are $15. Tickets for seniors, age 60 plus, and juniros, age 6 to 15 are $7 with kids 5 and under admitted free. The speedway offers a budget friendly family pack, for $35, which admits two adults and three juniors. There are a couple of important announcements that the speedway wants their race teams and fans to be aware of. First, and foremost, they ask you not to believe the rumors currently circulating that claims the track will be closing. The All American Speedway will be open for the 2016, they are set and ready to go and they're looking forward to it. Also, they want to remind their race teams of the new tire rule that will soon go into effect. Realizing that many of the teams still have left over Hoosier Tires in their inventory, they will allow them to be used through this Saturday night, April 23d. After that, the teams will need to make arrangements to switch to American Racer Tires. Saturday, April 23rd Kern County will again be featuring the NASCAR sanctioned Whelen All American Series this Saturday night featuring the NASCAR Late Models, NASCAR Super Stocks, NASCAR Mini Stocks, the INEX Legends and their 911 Racing Series with area first responders behind the wheel. As an added bonus the raceway will . be launching the official debut of their Golden Empire Super Moto Series. The spectator gates will open at 5pm followed by opening ceremonies and racing at 7pm. The raceway recently launched a new price structure for their tickets that is both fan and budget friendly. General admission tickets, age 16 plus, are $10. Tickets for active duty military, seniors and kids 6 to 15 are $7. Kids 5 and under will be admitted free. Saturday, April 23rd Las Vegas will be presenting their second annual Hometown Heroes Night, presented by K&N Filters. Representatives from local police, fire, EMT and first responder agencies will display of vehicles at the track behind turn one and will also participate in virtually every aspect of the festivities, from the National Anthem and presentation of colors to the waving of the green flag to start the night's races. All area police, fire and first responder personnel with a valid ID, along with four members of their families, will receive free admission. There's also going to be a full evening of racing action led by the NASCAR Super Late Models who will be running twin 35 lap main events. Also on the schedule is a 30 lap feature from the USAC HPD Midgets, twin mains from the NASCAR Bombers and the USLCI Thunder Cars. In still more racing, on this very busy night, the schedule includes the NASCAR Grand American Modifieds and the USLCI Legends along with the Bandoleros' Bandit and Outlaw divisions. The spectator gates will open at 5pm followed by qualifying at 5:15pm and opening ceremonies at 650pm. The Las Vegas Bullring is also budget friendly to its fans who can save money by purchasing advance tickets by visiting the ticket office, calling 1 800 644 4444 or ordering the tickets online at www.lvms.com. General admission tickets for adults are already on sale at a low price of $8. The Bulling very fan and budget friendly at their concession stands where fans can buy $2 hot dogs and Coca Cola products along with $3 Budweiser products. Remember, anytime you can place the words racing and Las Vegas in the same sentence it's a good thing. Saturday, April 23rd After inclement weather forced cancellation of last weekend's schedule season opener, the OSS will again present race number one of season number 68 at the historic quarter mile paved oval, presented by 1 800 Loan Mart. Providing the on track excitement will be Legend Cars, Open Late Models, Street Stocks, Mini Stocks, Bandoleros, the Barber Pole race and the Outlaw Figure 8's. The racing goes green at 7pm. The OSS is also very fan friendly with their ticket prices. General admission tickets, age 13 plus, are only $8. Tickets for seniors and kids, age 6 to 12, are $6 with kids five and under along with active duty military personnel admitted free. Saturday, April 23rd. Tucson on track action this Saturday night will feature their Super Late Model, Truck, Bomber and Mini Stock divisions. The spectator gates will open at 5pm with the racing going green at 7pm. The evening is being presented by Sierra Cycles. Also on the excitement agenda will be the Great American Trailer Race. This special race is open to any van, SUV, pick up truck including 4 wheel drive and of course cars. The object is to finish the race with your trailer attached while trying to separate the trailers of your competitors from their vehicle. If you lose your trailer, you will be disqualified and you will be black flagged. If you hit another two vehicle with your vehicle, you will be disqualified immediately. The length of the race is at least ten laps unless one of the trailer/two vehicle combo remains intact. In that event, they will be declared the winner. General admission tickets, age 17 plus, are $12. Tickets for seniors, age 55 plus, and military personnel with valid ID are $10. Kids tickets, age 11 to 16, are $5 with kids 10 and under when accompanied by a paid adult. The speedway also offers a budget friendly family pack, for $30, which admits two adults and two kids. Bakersfield, CA – Pinnacle Peak Steakhouse of Colton and San Dimas will continue their support of the teams of the SPEARS Southwest Tour Series in 2016. With their continued association with the series, Pinnacle Peak Steakhouse will be the presenting sponsor of two marquee SPEARS Southwest Tour Series events in 2016. Those events include the upcoming April 30th race at Irwindale Speedway and the $10,000 to Win 2016 Championship finale at The Bullring at Las Vegas Motor Speedway on November 19th. The SPEARS Southwest Tour Series visits Irwindale Speedway on April 30th for Round #2 of the 2016 season. Under an abundance of Saturday afternoon sunshine, and a huge break from the 60 MPH winds that plagued California's Antelope Valley the day before, six racing divisions responded to the green flag in what would turn out to be another day of racing fun at the Speedway Willow Springs. 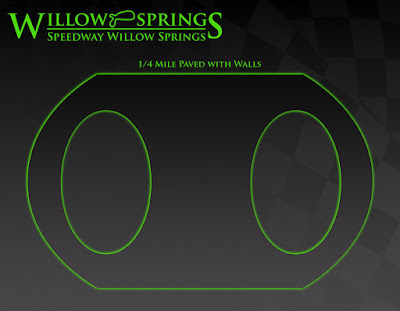 The quarter mile paved oval is located within the 600 acre complex known as Willow Springs International Raceway in Rosamond, California. In the 40 lap Hooper's Rear End Service Elite Division main event, David Brandon picked up his first win of the still young season in rather dominant fashion. Speedway veteran Randy Wilkins led the field to the initial green flag and paced the event for the first eight circuits before Brandon was able to make an inside move, going into turn three to become the new race leader. It turned out to be the race winning move. At one point in the event Brandon held a full straightaway lead over Anthony Mainella. Late in the race Mainella picked up a few ticks on the stop watch and reduced Brandon's lead to one half of a straightaway. However, despite being the fastest car on the track, time and laps ran out and Mainella had to settle for the runner up finish. The margin of victory was 3.715 seconds. After the race Brandon lit up his tires and performed a victory lane burnout that completely engulfed his car in smoke much to the delight of the fans. Speedway veteran, and past track champion, Chris Peedan crossed under the checkers to take third and was followed by Tony Forfa, Alex Anderson, Rich Wilson and Randy Wilkins. Earlier in the day Peedan set the fast time in qualifying with a hot lap of 15.376 seconds. Mainella won the division's heat race. In Platinum Loan & Jewelry Street Stock action, Dwight Kelly roared out of his front row outside starting position to take the lead. Throughout the majority of the 35 lap main event, the top four drivers lined up bumper to bumper while displaying the meaning of an old stock car racing term known as the freight train shuffle. It was almost like the drivers in positions two through five were waiting for that special moment in time that would allow them to eradicate Kelly's lead and steal the win. That moment in time appeared on lap 28 when Kelly's car inched towards the high side while he was negotiating turn two. That left Tony Forfa IV just enough room, on the turn's low groove, to work his way into the race lead. At this point Forfa, to coin another old racing term, literally checked out of the hotel and won the race with a 8.289 second margin of victory. Bruce Secord, the winner of the speedway's season opener, drove under the checkers to take second and was followed by Jerry Baxter, Kelly, Ray Butler and Justin Good. Earlier in the day, Secord set the fast time in qualifying with a lap of 16.257 seconds. Justin Good was the winner of the division's eight lap heat race. In the Wayne & Dave's Automotive Hobby Stock 35 lap main event Johnny Troesch came out of the front row, at the initial green flag, and turned in a formidable performance and led all of the event's laps to score a flag to flag win as well as his second, consecutive, division win. His margin of victory was a whopping 18.170 seconds. Brandon Fisk came across the line in second followed by Corey Carter, Michael Williams and Rod Sproule. In preliminary action Fisk set fast time in qualifying with a hot lap of 16.751 seconds. Williams won the division's eight lap heat race. In the Lucas Oil Mini Stocks main it was a case of the same car, a Ford Mustang, winning for the second time in a row but with a different driver sitting in the seat. John Dunlap drove the car to victory during the March 26th season opener while speedway veteran and former track champion Bobby Dezarov parked the Mustang in victory lane this past Saturday. Following the waving of the initial green flag to start the race, Dezarov came out of his pole position starting berth and jumped into the lead. He led all 20 lap of the race to score the win. His margin of victory over runner up Greg Didoha was 2.559 second. Jeremy Queener came across the line in third and was followed by Randy Hannah, Danny Quinn, Matt Peterson, Nick Higginson and Tim Ogdon. Dezarov's excellent day at Speedway Willow Springs included hitting the trifecta by setting the fast time in qualifying, 16.479 seconds, and winning the eight lap heat race. Skid Plate racing is a popular form of racing that has swept southern California in recent years. The concept calls for the rear tires, of a small sport compact type race car, to be removed and replaced with a pair of steel hub welded to flat steel plates. These plates slide across the track surface showering sparks.The other result is a challenge for the driver of these cars to maintain control due to the fact that the rear end of the vehicles slide around. Spin outs, as well as fender bender situations, are quite common because these vehicles totally redefines the racing term loose race car. To no real surprise, the Tire Store Skid Plate division has become very popular with the fans at Speedway Willow Springs. During last Saturday's 12 lap main event there were more cases of race cars doing 360 degree spins than could be counted. On lap ten of the race two car hooked bumpers with the result being fender benders and more spins from the drivers behind them trying to avoid the melee. The red flag came out for track clean up and that's when the speedway's Race Director called the event two laps prior to completion. Daniel Chadwick was declared the winner. He noted that this was only his second ever race. The first was at Speedway Springs on March 26 when hard luck created a major learning curve for the young driver. However, it was lessons well learned because they helped Chadwick take home the winner's trophy. One of the extremely popular events at Speedway Willow Springs is the So Cal Enduro Racers. Created and promoted by Ridgecrest resident Danny Quinn, these sport compacts run lengthy events under very unusual conditions such as driving around huge tractor tires located at the edge of the speedway's two straightaways. Last Saturday's race was billed as the Motion Tire Motorsports 100 which was divided into twin 50 lap segments. During the first segment, Michael Walters led the opening laps until Joe David took the point on lap 12. Unfortunately, bad racing luck hit David, on lap 37, when he suffered a flat tire. Nate Van De Venter became the new front man and guided the field to the end of the first 50 lap segment. The twin segment was utilized due to the fact that the transponders, an electronic device on the cars that sends track position data to a computer located in the speedway's race control tower, required reactivating. The teams were also given seven minutes to work on the cars with many of them electing to change tires. During this intermission something rather bizarre happened. Two race vehicles, a full size truck and a large bomber stocker, came out on the track towing boats. The tow chains were released from the boats and the two vehicles circled the track while repeatedly running into the boats. The result was a case of maritime murder and the boats were soon reduced to piles of debris. It turns out that the management of Speedway Willow Springs likes to stage a little destruction now and then while sharing the moment with their fans. Following track clean up, it was time for the Enduro teams to line up for the start of segment two of the Motion Tire Motorsports 100. Nate Van DeVenter picked up the pace, where he left off in the first segment, and began putting asphalt between himself and his closest competitor. It appeared that he was well on his way to collecting the $400 winner's check. Unfortunately, with the race three quarters complete, the tell tale signs of heavy white smoke began to drift from the back of his car. This was followed by a rarely seen event when the battery came flying out of the window of one of the cars and landed on the track. The result was a red flag condition to allow clean up followed by a standing still restart. That restart came very quickly and Van DeVenter's car was slow to respond and, by the time he recovered, five cars passed him. To his credit, Van DeVenter did find a way to drive his ailing car to a fifth place finish despite all of the white smoke streaming out the back of it. Meanwhile Pete Chilbes became the new race leader and made quick work of running out the waning laps to claim the win. Unofficial results, pending a complete review of the lap charts by the speedway's scoring team, showed Jake Basham and Randy Hannah following the race winner under the checkers. There's a lot of excitement attached to the So Cal Enduro Racers and it's very easy to see why they've become so popular with the fans. This is a top shelf, well run, racing program that has unlimited potential for a very bright future. 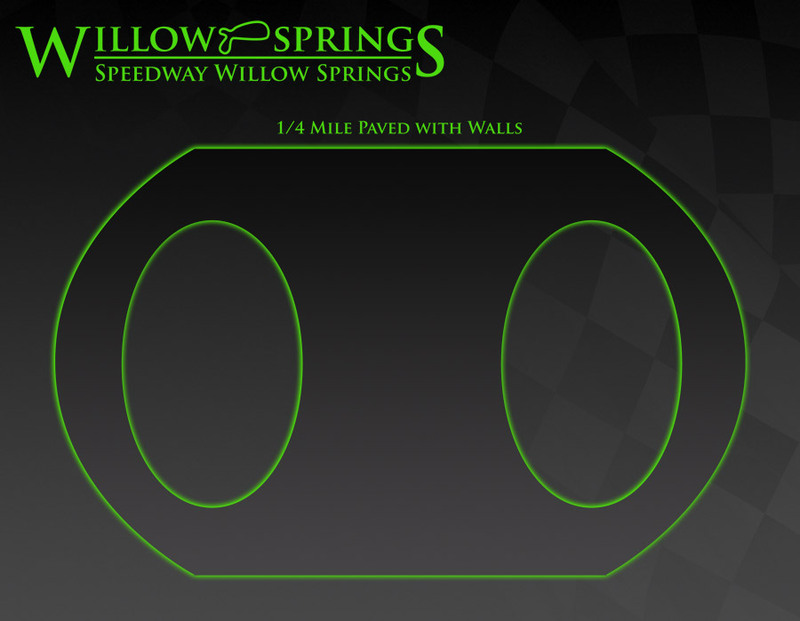 Racing returns to the Speedway Willow Springs on May 14th featuring the same six divisions. With the late spring, early summer, expected to be in place in the Antelope Valley area, the speedway will begin its night racing schedule meaning the first race will begin at 6pm. The Speedway Willow Springs is greatly enhanced, and blessed, with a large group of track sponsors that includes: A To Z Signs, Abadak, Adams Metalizing and Grinding, Angel's Touch Towing, Benz Sanitation, Deist Safety, Dezarov's Mobile Auto Service, Dominguez Mexican Restaurant, 51 Fifty Energy Drink, Frank's Radios, High Desert Cellars, Hooper's Rear End Service, KGG Electric, K&N Performance Filters, Linny White's Race Shop, Lucas Oil Products, Misfit Motorsports, Pinnacle Peak Steak House-Colton and San Dimas locations, Platinum Jewelry and Loan-Lancaster, Scramblez, Street Customs, Studio Equipment Rentals, 10,000 RPM, The Tire Store and Wayne and Dave's Automotive. ROSEVILLE, CALIFORNIA (April 16, 2016) - 2009 All American Speedway Late Model champion debuted a new car for Saturday's Pacific Challenge Series 100 at the one-third mile oval and promptly won the feature, in a crowd pleasing duel to 2014 PCS champion Mike Beeler. Saturday's nights races presented by PenneyLawyers.com served as round two for the touring Super Late Model championship series. Mike Beeler won the $500 Dash for Cash after some nice outside moves against Loomis' Chris Scribner, with the dash finish setting the lineup for the main event. The battling between the two continued on a red-hot race track with five drivers breaking the track record in qualifying. Eric Schmidt of Roseville, CA is both a PCS and All American Speedway champion and used the outside to get around Romero at the start to take third. Jason Mitchell and Jimmy Stillman tangled with both black and red 39 cars making contact in turn four the next caution. Romero stumbled on the restart and fell back to the eighth position with Matthew Wendt in his series' points race debut also falling backwards from the top-five. Doss got around Scribner but Scribner was able to take the position back on lap 44 to maintain second. Mike Hite spun across the infield grass for a lap 54 caution and Wendt spun for another caution on the ensuing restart. Things again settled down and stayed green allowing Romero to swoop past Doss on the outside for the third position. The intensity picked up as Romero then used an inside manuever to take second and start to reel in race long leader Mike Beeler. Romero cruised home for the victory while Beeler had to settle for second with Bischofberger and Scribner both managing to get past Doss before the finish. Canadian Darrell Midgley came from 13th on the grid to finish sixth for the Penney Racing Supply Hard Charger ahead of John Moore, Tracy Bolin, Ryan Peeples of Anderson, CA with a strong top-ten, and Hayward's Danny Malfatti with his second straight PCS top-ten.